Vettel under investigation for failing to slow down sufficiently under the red flag. If found guilty he will get a grid penalty. This rule is so unnecessary. How does it improve the sport? It's not as if there was ever an issue with drivers not respecting the red flag. Ricciardo and Ocon both got 3 place grid penalties this year for the same infringement. No coverage of practice or even promotion of the event HMMMM. But atleast nascar is on walking around the kansas pits. They do show the race will be on though. 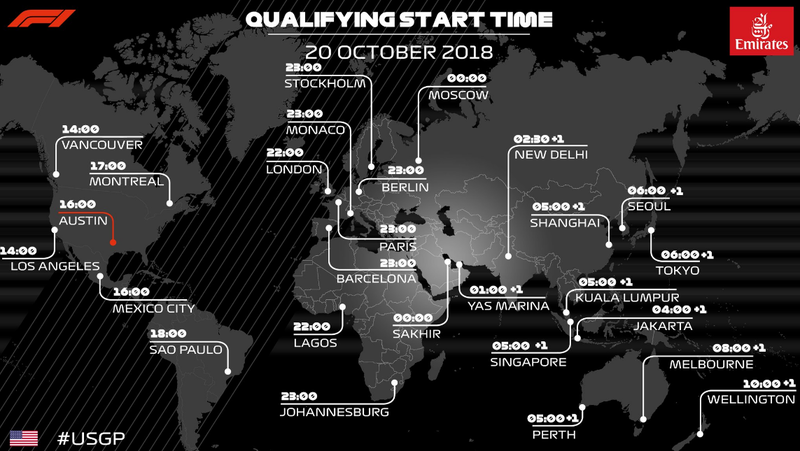 F1 says they will have qualy but it does not show in the listings. Maybe in the dry you have a point but in the wet... are we forgetting how Bianchi lost his life already? A reminder, he was driving a little too quickly through a yellow flag zone and left the track and high speed heading toward marshalls and machinery on the track side. Just seen Vettel's onboard he didn't slow down to the 90Km/h speed quick enough, he slowed down to 110Km/h recognising the red light which was not slow enough and then momentarily speeded up to 150Km/h and then soon after finally slowed down to below 90Km/h. Pirelli should get some funds so they can produce wet tyres enough to supply more sets to all teams? Maybe Pirelli should demand the funds from the spectators who don't mind getting wet & have to get their patience tested!!!!!! I'm just wondering if they pick the wrong time of the year to race in Austin given how often it seems to rain? Sounds like he's past caring. 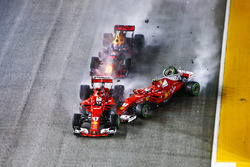 Seems a bit harsh, but if everyone else slowed down and Vettel didn't.... Sloppy Ferrari again? Almost looks deliberate. He does need a sport psychologist. He has basically gift wrapped this years title to Lewis. It’s a shame. Historically, October is usually dry in Texas. TX was in drought as recently as late September. I run another weekend-long outdoor event annually in North Texas. And normally it is dry. However, we've gotten more than a full year's worth of rain this year and in Oct. 2015, 2017. Some of it related to a happenstance hurricane (Harvey 2017). This year they are blaming all the water on an "El Nino" pattern from the Pacific. He should look into getting Amazon Prime to sponsor him. Dunno, Jeff Bezos would expect reliable and timely deliveries from Seb! This season from Vettel is starting to be hard to believe. It's a bit of a clichè but Vettel must just want this season over and done with so he can regroup and refocus in the winter. Almost everything that can go wrong is going wrong. Wrong time or not, Pirelli don't mind allotting 13 sets of dry tyres but when it comes to wet tyres, they have 3 intermediate sets & 2 wet sets (not sure with the numbers for wet weather tyres)? Sainz said yesterday drivers would've been out for longer time had Pirelli & FIA agreed to allot more wet tyres per driver. What's the point in allotting limited set of tyres? Pirelli out of rubber??? It's clear that he speeds back up substantially (all the way to 170 kph) after he's definitely noticed the red flag. No excuse, and I don't know what he expected. Speeding under red flags is dangerous to everyone. Vettel mentioned the stewards said it took him 27.7 seconds to drop to 90km/h. Well when watching that onboard its clear he didnt hit 90km/h until that point. Yes, he initially slows down a bit, then speeds up past flashing reds and only really slows down when he turns a corner and sees a car at the far end of the straight going noticeably slower - THEN he slows down. Well considering practice was red flagged because there was a bit of gravel on the track, if it rains on Sunday I half expect the race to start behind a man waving a red flag. Last edited by cmberry20 on Sat Oct 20, 2018 10:49 am, edited 1 time in total. Crofty on Sky reckons it is to do with shipping costs. No idea if that is true. He was supposed to slow to 90Km/h and at one point accelerated back up to 170Km/h, it's like his mind was wandering or something, he wasn't in the game. No just the cost of transporting extra tyres when most of the time you don't need them. Watching that, I think it's difficult to come to any conclusion. When you hear the version of events, it sounds like he just didn't lift off fast enough, but the fact that he got down to nearly 100km/h and accelerated back up again (twice) before finally dropping down to below 90, just shows his head was somewhere else.